A big thank you to all club members who with their friends, family members and other enthusiasts made the trip to Milton Keynes Museum at the weekend for this year's Annual Rally. 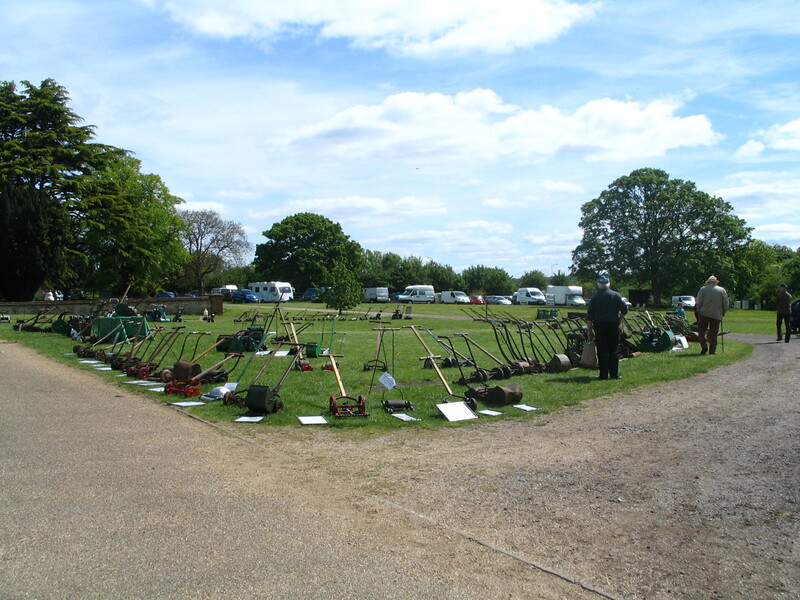 It really was one of our best-ever events with more members present and mowers on show. We had members visiting from all four corners of the UK as well as Ireland, the USA and New Zealand. We'll be posting more news about the event over the next few days but first-off we've posted some images of mowers and people in the events section. Click here for the latest list of items entered for the auction at the Annual Rally. The auction will start no sooner than 11am on Sunday 17 May. Although the lawn mower was invented in England plenty of manufacturers were soon established in other parts of the world. In the Victorian and Edward eras, for example, there were any number of manufacturers elsewhere in Europe and in the USA. Later as the number of UK manufacturers declined, names that are now familiar (and some less so) grew in Europe, Australia and New Zealand. We’re celebrating this diversity at this year’s annual rally with a theme of “foreign” mowers by asking members and enthusiasts to bring their overseas machines to put on show. Many of these foreign companies also made machines for sale in the UK badged in retailers’ and wholesalers’ names. Often these – usually hand mowers – were sold as “own brand” by the particular reseller in their department stores and through their catalogues. In mower-collecting circles these are often known as “catalogue” machines. While many of these were made by UK-based companies – including some of the larger manufacturers – a significant number were made overseas, especially the USA and Germany. Usually the only clue to a catalogue mower’s origin is its similarity to a standard model from a particular manufacturer. Sometimes the mower would be labelled as “Made in USA” etc but this is not universal. Indeed, during the 1920s and 30s, in particular, machines made by German companies such as Brill were typically labelled simply as “Foreign”, perhaps reflecting attitudes in the UK at that time towards a recent (and soon-to-be) wartime enemy. All of these machines are welcome at the rally this year. Incidentally, following the result of the Scottish referendum last year, machines made by Shanks don’t qualify as foreign. Following the results of the general election this might well change! To celebrate the 25th anniversary of our very first annual rally this year’s event will have as one of its three themes “silver jubilee” mowers. For this we are hoping to display machines with some kind of connection to the number 25. This might include, for example, mowers that have a 25 inch cutting width – are there any we wonder? We’re also hoping to assemble some machines with “Silver” or “Jubilee” (or similar) in their names – there are a few but we’ll happily take anything that loosely fits the bill. In keeping with our aim to be as inclusive as possible we’ll have a fairly flexible definition of what might qualify and will be open to persuasion on the day as to the merits of individual machines. Even a silver-coloured machine would qualify. We will of course welcome any machines made in 1990. It’s odd to think that mowers made when our club was in its formative years are now considered “old” by many collectors, particularly our younger members. Nevertheless, if you think about it, many of us would have though 1965 was quite old in 1990! These mowers all fit with our "silver" theme. The one on the left is an Archimedean made in the late 19th century. The one in the middle is a Farmfitters Rapier from the 1950s. The one on the right is a Greens Zephyr also from the 1950s. This particular example, which can be seen at the British Lawnmower Museum in Southport, was uniquely produced with a highly-polished chrome finish as a special exhibit at the Southport Flower Show in 1960. Brian Radam, who runs the museum, brought this machine to one of our first ever club rallies.